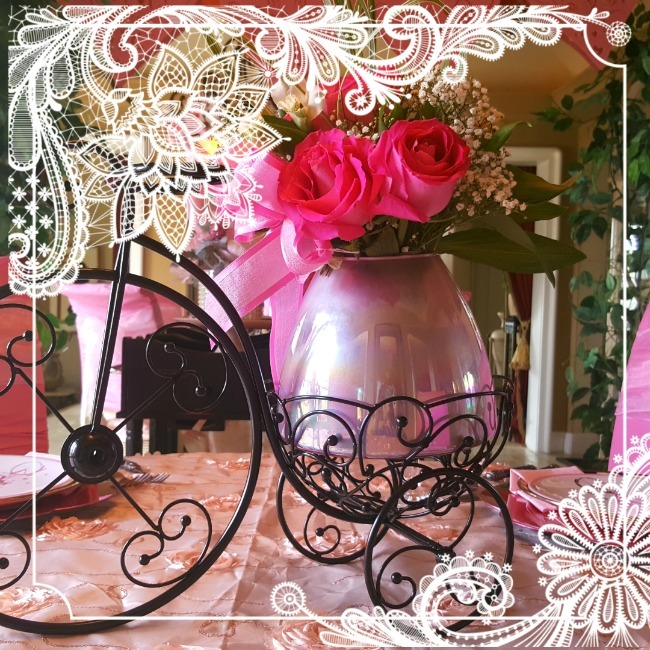 Since I am loving pink at the moment, I thought I would create a tablescape with pink and black. In my previous post, I shared how the flowers are blooming here in California. Spring is on it's way. I do hope we get more rain, so we avoid the drought and those awful wild fires. I love using my Mackenzie Childs' plates. Are you ready for Spring? I have been working on some Easter and Spring decor. The Elegant wooden box my husband built makes a great centerpiece for seasonal decor. I am dressing it for a pretty spring look. Stay tuned! Don't forget March 1st, Tales of the Traveling Tote gals are having another Mackenzie Childs Giveaway. I think we are all ready for some spring weather Stacey. Thank you. Thanks Jenna, gotta love ❤️ those pink plates. Such a charming table! I love black and white and its' evident in my interior decorating - particularly on the covered porch. Envy you those MC plates. Did you get those chargers recently from Michaels? Thank you Debee. It’s been awhile since I bought those plate chargers. They are Celebrate It by Michaels. I also recently saw Bed Bath & Beyond has some black and white plate chargers. Thank you Alycia. Yes, pink plates. They are Nicole Miller pink bike plates. I see them on EBay. You might find them at Home Goods, Marshall’s or TJMaxx. 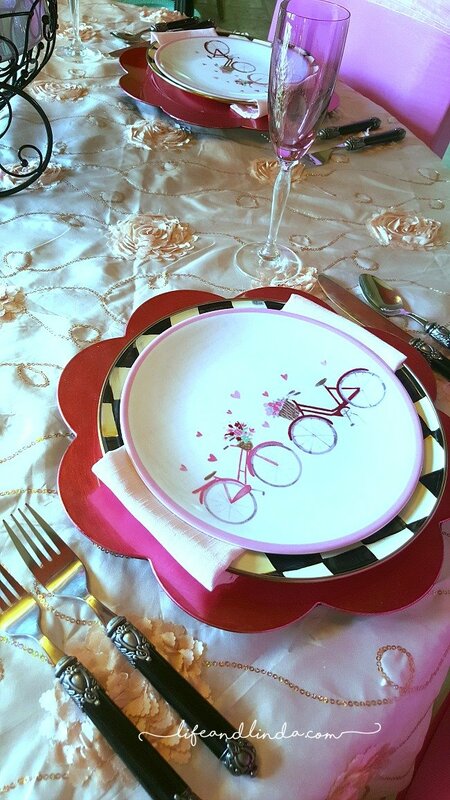 Pretty table - love the bicycle dishes! Patti, those plates are a big hit! Thank you. This is super cute, Linda. Those bicycles from Ross and the plate from Marshall's are adorable, but I love those striped chargers with the CC plates too! I hope you guys get the needed rain too this year. Your flowers are beautiful right now. I love the energy that spring brings! Rita, thanks so much! We are so fortunate to mix and match our MKC things. I was trying to search to see if those striped chargers were still available. I could not find them, but I am sure they could be reproduced with paint. Oh my!!! This is my favorite by far! I love bicycle themes. Im in awe over here!!! Cute theme,Linda. The pink and black are fun together. I say anything goes with Courtly Check! Thank you Sarah, I think you are right. Everything seems to go with Mackenzie Child’s Courtly Check. Isn’t it great fun to mix and match with MKC Emily? Thank you. Debra, isn’t great fun! Thank you. Love the theme Linda. I am going to have to check out my Marshalls for those adorable plates. Kris, thank you. Good luck in the search. The bicycle plates are Nicole Miller. Linda this is the cutest ever!! You are the queen of creative! Thanks so much Sherry. You are so kind. I hope you are well. Happy is such a wonderful feeling Monique. How cute is this! Love the bycicle plates and they look perfect on the MC plates. That centerpiece arrangement is adorable! 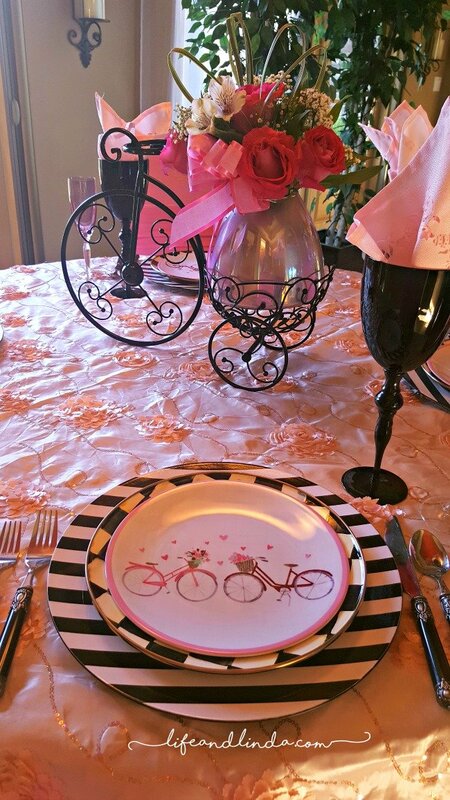 Thank you Liz, I just fell in love with those pink bike plates. The bicycle centerpiece was a great find at Ross. I also have a smaller version. Love ❤️ that store. Your table is so cute. Love the bicycle plates on the MC courtly check plates and the Marshalls chargers. 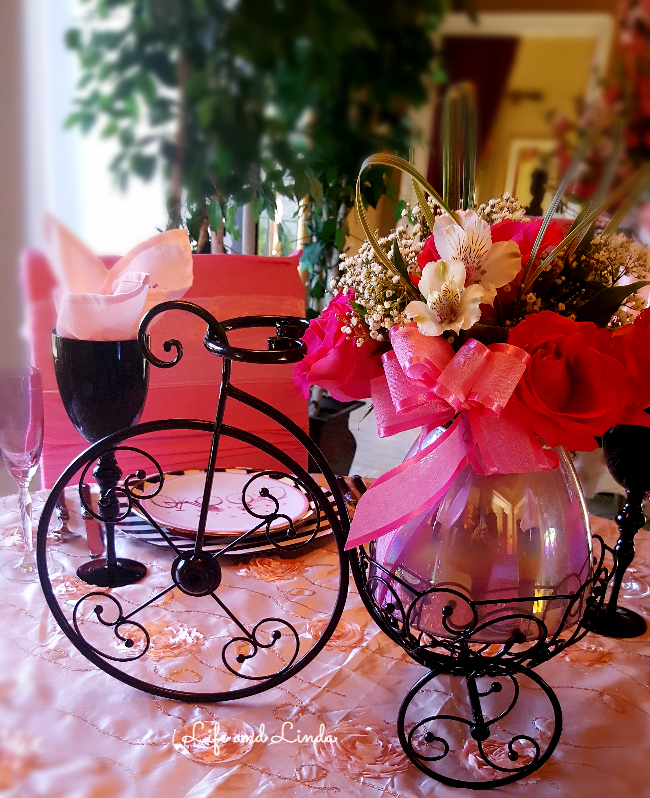 How fun to have a bicycle centerpiece, too! Thanks so much Bonnie. Aren't those plates fun? How pretty, Linda! I just love the centerpiece you used for this tablescape. The dishes are beautiful! Thank you Maria Elena, I feel in love with the centerpiece. So girly and pink against the black bike. Oh, Linda, I always want to sit at your table so I can really see and enjoy your lovely table scapes. The MC plates are so, so pretty. Always enjoy strolling by! 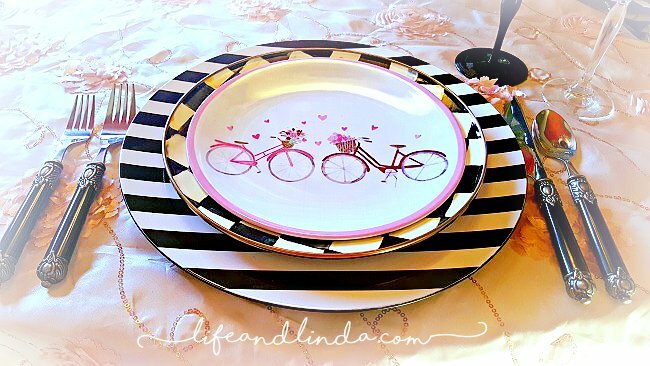 Oh, Linda.....I love this table because the bike plates are the very cutest. I love bikes! One of my favorite things in the world....BIKING!!!! I just saw the cute bicycle plates on sale at Marshall's in Lake Placid. They are adorable! 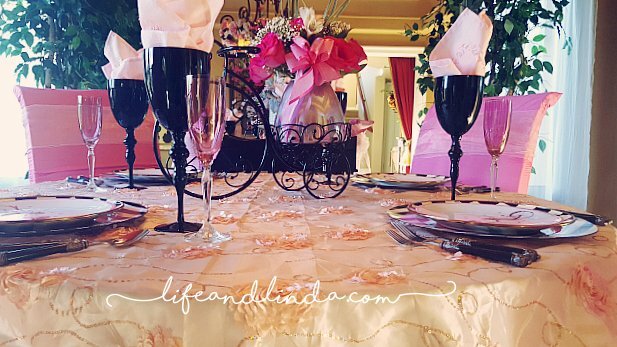 I love this tablescape and the adorable pink and pretty tablesetting. 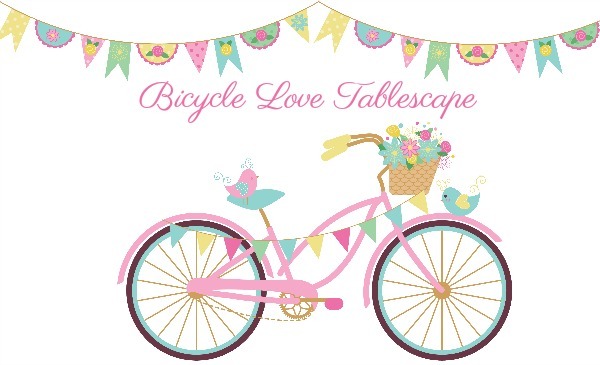 I adore bikes and these plates are wonderful!! Happy, happy!